California's Proposition 30 asks voters to decide on Gov. Jerry Brown's temporary tax increases. What makes this vote interesting at the national level is that it is California's version of the fiscal cliff. Clearly the proposed tax increases or the budget cuts will not have anywhere near the effect expected from the US fiscal cliff, but it works in a similar fashion. Either the state gets the needed revenue by taxing the "rich" or it will face automatic cuts. Of course those making $250K in LA are already heavily taxed and the new taxes may hurt business formation - but that's a discussion for another time. LA Times: - Proposition 30, Gov. Jerry Brown's tax initiative, would narrow the state's budget gap by bringing in $34 billion or more over seven years — much of it by raising income taxes temporarily on those with incomes over $250,000, and the rest by a temporary, quarter-cent increase in the sales tax. The income tax increase would expire after seven years. The sales tax increase would expire after four years. The initiative would also guarantee aid to local governments to help pay for the responsibilities that the Legislature shifted onto their shoulders through Brown's public safety realignment strategy. If the initiative fails, $6 billion in automatic cuts would go into effect this year, mainly at the expense of public schools. In fact education will absorb the bulk of the budget cuts, should the initiative fail. JPMorgan: - Because Proposition 30 was crucial to the Governor passing a “balanced budget”, mandatory triggered cuts will go into effect should the measure fail at the polls. 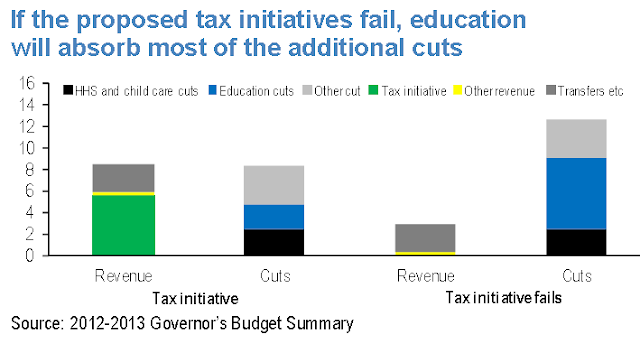 ... most of the cuts would come from education, with a portion also coming from Health and Human Services and childcare. Specifically, $5.5bn of cuts would come from Proposition 98 [ K-12 education] funding, and $250mn would come from both the University of California and the California State University. Apparently the public was generally supportive of Proposition 30 when it was first announced. After all taxing the "rich" to fund educational programs has been popular in the past. But now the questions have been raised on whether some of the state's education initiatives should be funded in such manner at all, particularly given Sacramento's history of wasteful spending. Maybe there are better ways to fund schools with additional taxes than through a centralized tax machine. Should the politicians prove that they are able to cut waste before they can be trusted with additional tax revenue? An alternative to Proposition 30 is Proposition 38, which would raise taxes across the board (with the higher tax brackets increasing much more of course), but the funds would be walled off to be used for education only. 38 is not expected pass because while Californians support education funding, they don't want their taxes increased to pay for it (unless the increases are only on the top tax bracket). Either way, the battle over Proposition 30 may serve as a litmus test at the national level for the public's willingness to trust the government with more tax revenue.